A rumor is currently circulating, stating that the Samsung Galaxy Note 4 will soon be getting with a brand new chipset. 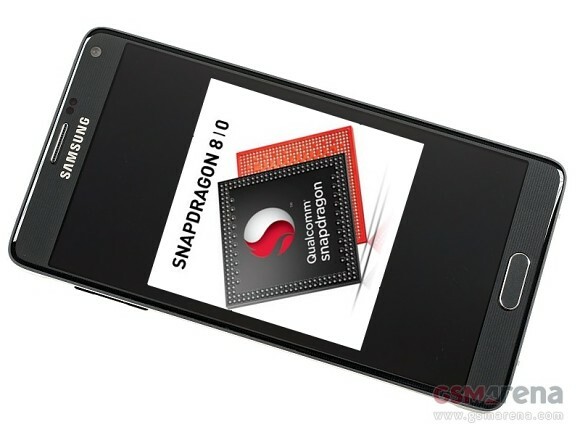 The SoC in question is allegedly the Qualcomm Snapdragon 810. Samsung's flagship device currently comes in two hardware flavors - the in-house developed Exynos 7 Octa and the Qualcomm Snapdragon 805. These are both solid chips, but the Snapdragon 805, being by far the more popular and powering significantly more units is lacking in one particular respect - it features a 32-bit architecture. This could potentially cause issues with the phablet's futureproofing, given the strong push to a 64-bit application ecosystem, introduced by Android 5.0 Lollipop. The Snapdragon 810 remedies this issue, as it is a true 64-bit octa-core CPU. It also brings the Adreno 430 GPU to the table, which is also a significant improvement over the current Adreno 420 found in the Galaxy Note 4. The new device is allegedly already being tested by the three major South Korea mobile carriers, but that is unconfirmed either. A Snapdragon 810 Note 4 sounds tantalizingly good, but for the time being all we can do is wait for further development to the story. If I was you, I would wait. Depends strongly on how long you'd like to use that phone as your main device.